Published: June 26, 2014 at 11:20 a.m. Updated: June 26, 2014 at 01:38 p.m.
College Football 24/7’s 14 for ’14 series continues with a look at some of the top coordinators in college football, mixing young up-and-comers with others seasoned with plenty of experience. Expect some to join the head-coaching ranks in short order. Naturally, the hottest offensive coordinators generally favor throwing a lot of passes as the college game continues to trend in that direction, and tend to be younger. The top defensive coordinators? More often, they’re more experienced and proven to adapt and survive the latest and greatest developments in the forward pass. 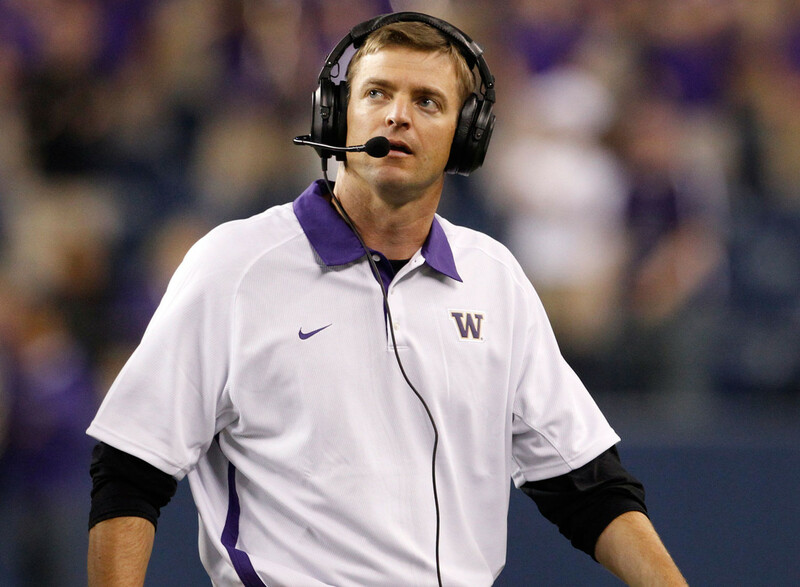 Wilcox has coordinated defenses at Boise State, Tennessee and Washington since 2006, and takes on the Southern Cal defense beginning this season under new Trojans coach Steve Sarkisian. The Washington defense Wilcox inherited in 2012 came off the 2011 season having allowed a whopping 426 yards per game, and Wilcox cut nearly 50 yards off that total in his first year. Last year, UW ranked No. 4 in the nation in sacks with 3.15 per game. With Southern Cal's recruiting base, Wilcox should have the best talent of his career to work with in the coming years. Riley drew interest from some major college programs as an offensive coordinator last winter, but ended up staying at ECU. That might not be the case next year, however, if the Pirates' offense continues to flourish under his leadership. This fall will be his fifth at East Carolina's OC, so he's got significantly more experience than a few listed here. Last year, ECU's offense broke a school record with 6,086 yards in total offense. In six years as offensive coordinator at Duke, Roper's offenses consistently improved, culminating with last year's school-record 54 touchdowns. Perhaps most impressively, his success there certainly hasn't been the result of great recruiting, as Duke doesn't compete for the same level of athlete that other football powerhouses do. He learned under Duke coach David Cutcliffe, who was a proven offensive coordinator himself during Tennessee's most dominant periods under Phil Fulmer. Roper has now been placed in one of the most pressure-packed coordinator seats in the country as the man charged with fixing an ailing Gators offense for a fan base that has been spoiled with great offenses for most of the 25 years since Steve Spurrier took over. College assistant coaches, as much as anyone, are subject to market value. Big opportunities come before big raises, not the other way around. Norvell is a classic example, as interest from Arkansas State (as head coach) and Florida (as offensive coordinator) last winter got him a $200,000 raise to $700,000 to stay. That's more than double what he signed on for just two and a half years ago. The proof of Norvell's value is on the scoreboard: ASU averaged 41 points a game last year. No assistant to work under Nick Saban at Alabama has moved up the coaching ladder faster elsewhere than Pruitt. In just seven years, he went from a support staffer at UA, as director of player personnel, to being one of the highest-paid defensive coordinators in college football at Georgia. Pruitt left Alabama as a secondary coach two years ago to become FSU's defensive coordinator. In his only season in the role, the Seminoles won the BCS national championship with the nation's No. 3 defense. Pruitt received a $350,000 raise, from $500,000 to $850,000, to join the Bulldogs. The track record on Spavital is a short one, and his mettle as an offensive coordinator will get a much better test in 2014 than it did last year with superstar Johnny Manziel making his every move look genius. Nevertheless, Spavital has to get at least a piece of the credit for Manziel's obvious development as a passer last year. For a quarterback whose reputation remains one of a reckless runner, the truth is, Manziel was much more patient in the pocket under Spavital. Aranda joined the Wisconsin staff as defensive coordinator with big results last year, leading the Badgers to top-10 NCAA rankings in scoring defense, total defense and rush defense. Wisconsin also got off the field on third down nearly 70 percent of the time, one of the nation's highest percentages of third-down conversion defense. Aranda has also had successful DC stints at Utah State and Hawaii. When Chip Kelly left Oregon to coach the NFL's Philadelphia Eagles, the first question Oregon fans had was whether the Ducks' vaunted offense would skip a beat with Kelly's offensive coordinator, Mark Helfrich, taking over the program as head coach. Frost is one reason it didn't. Previously the Ducks' receivers coach, Frost was promoted to the coordinator role by Helfrich, who vacated it. Oregon racked up 565 yards per game under Frost, behind only Baylor as the No. 2 offense in the entire nation. Narduzzi won the Frank Broyles Award as the nation's top assistant after constructing the Big Ten's No.1-ranked defense for the third consecutive season. It ranked No. 2 in the entire nation at 252.2 yards per game, and just 86.6 on the ground. Narduzzi's defenses at Michigan State have been especially strong since 2011, which began a three-year run ranked in the nation's top 10 in total defense. After drawing interest from Texas A&M after the 2011 season, Narduzzi received a raise that more than doubled his salary to stay in East Lansing. It says a lot about Morris that in 2012, when his best player's production had a few hiccups, the Tigers' offense was still at its very best. Sammy Watkins had 708 yards and just three touchdowns that year, yet Clemson broke school records for both yards (513 per game) and points (41 per game). That's the sign of an offense that isn't overly reliant on one athlete, no matter how talented. At 57 years old, Chavis' window to be a head coach somewhere might not be open too much longer. But if you're Chavis, what's wrong with being one of the most respected defensive coordinators in the game? He won the Broyles Award in 2011 as the nation's top assistant coach, and has brought the same consistently-tough defenses to LSU that he was once known for at Tennessee. Three straight Chavis defenses ranked among the nation's best from 2010-2012. And despite some critical talent that departed early for the NFL, last year's LSU defense ranked No. 15. After 19 years coordinating the Virginia Tech defense for Frank Beamer, Foster's name doesn't pop up for head-coaching openings as much as it used to. At this point, the most likely head coaching role for Foster could be as the eventual replacement for Beamer himself. And Hokies fans would surely be fine with that. His last three units have finished in the top 20 in the nation in total defense, including a No. 4 ranking last year at just 283.6 yards per game. He won the Broyles Award as the nation's top assistant coach in 2006. Baylor is quickly becoming the Oregon of the South, and Montgomery is a big reason why. As the play-caller for what is arguably the fastest-paced offense in the country, Montgomery is on the cutting edge of offensive football in the college game. Baylor blew away the entire NCAA field last year in total offense, ranking No. 1 in the country with 619 yards per game. That beat No. 2-ranked Oregon by more than 50 yards. He coached Robert Griffin III to a Heisman Trophy-winning season, and might do so again this fall with star quarterback and NFL draft prospect Bryce Petty. The Alabama defensive coordinator has been considered a "hot" coordinator so long, he's easy to forget among some of the younger coordinators enjoying instant success. But don't forget this: Entering his seventh year the Crimson Tide's DC, in an NCAA FBS field that has fluctuated around 120 teams, Alabama has finished in the top five every year in total defense. With that kind of track record, Smart's head-coaching days are a question of when, not if. Until then, his $1.35 million salary is certainly enough to enjoy the status quo until the ideal head-coaching option comes along.